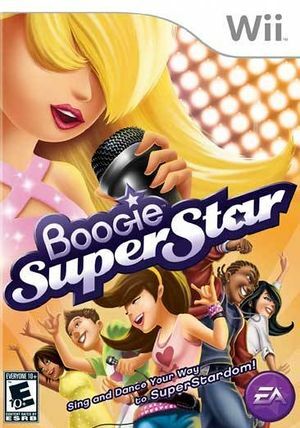 Combining the hottest music hits from around the world with the coolest dance moves and total character customization, Boogie SuperStar provides girls the ultimate gaming experience: to sing and dance their way to superstardom. Boogie SuperStar features more than 40 songs made famous by popular artists such as Rihanna, Fergie, Katy Perry, Maroon 5, Leona Lewis, Alicia Keys, Good Charlotte, Britney Spears, Kanye West, and more. Another 30 songs are available on International versions of the game, allowing players to perform songs from local artists including Melissa M (France), Monrose (Germany), Finley (Italy) and Fito y Fitipaldis (Spain). Players don't just play along, they are the star of the game. Girls will have a blast belting their favorite tunes into the microphone, and performing real dance moves that are captured on screen using the Wii's motion-sensing technology. With two- and four-player modes, girls can play with their friends sing and dance with their friends or against them in fun competitions that show-off their singing and dancing talent. Players begin the game by customizing their character, choosing from millions of possible combinations to create a performer that is as unique as they are. They are then "discovered" and whisked away to an island where they learn what it takes to be a star. While on the island, players build their singing and dancing skills, performing in posh environments fit for a rising star, including a studio, a poolside stage, a breath-taking terrace, and a yacht. Once performance skills are perfected, girls are ready to perform for a panel of judges in the ultimate competition, the Boogie Star Show. The graph below charts the compatibility with Boogie SuperStar since Dolphin's 2.0 release, listing revisions only where a compatibility change occurred. This page was last edited on 24 February 2018, at 15:40.